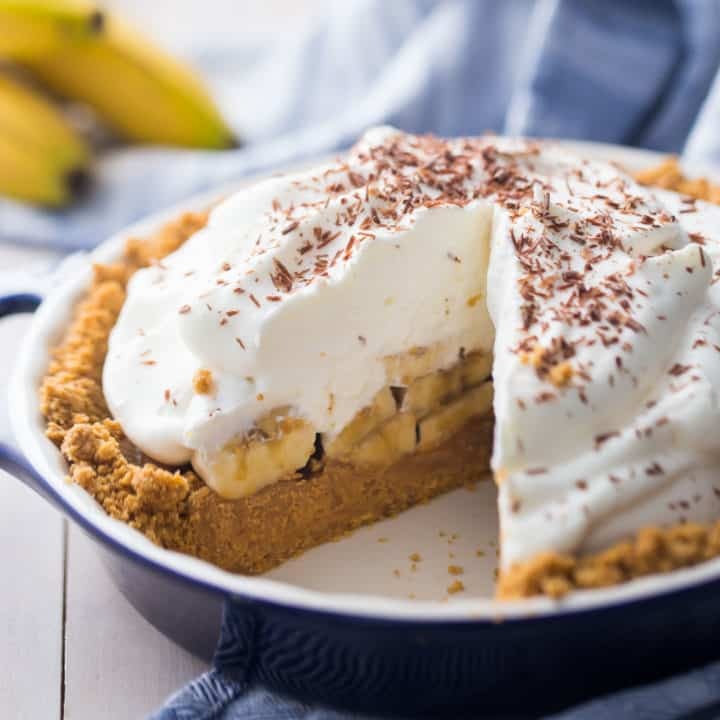 Banoffee Pie: a classic combination of bananas and toffee, layered in a crunchy graham cracker crust and crowned with whipped cream. You’ll fall in love! Helloooo, my friend! How is your January going? Ugh I can’t say I’m enjoying mine. It’s too dang cold. I’ve got a tropical vacation coming up next month and I’m just keeping my eyes on that prize! But for the time being, it’s all about snuggling in with comforting treats. One pot meals like chili and chicken pot pie are on heavy rotation, and we’re keeping warm with plenty of hot cocoa too. At this time of year, fresh seasonal fruit can be scarce, so it’s nice to bake with citrus and tropical fruits like bananas. So we’re spotlighting the banana in all its sweet and creamy glory. “Banoffee” is a mashup of two words: banana and toffee. And that’s just what this pie is all about! 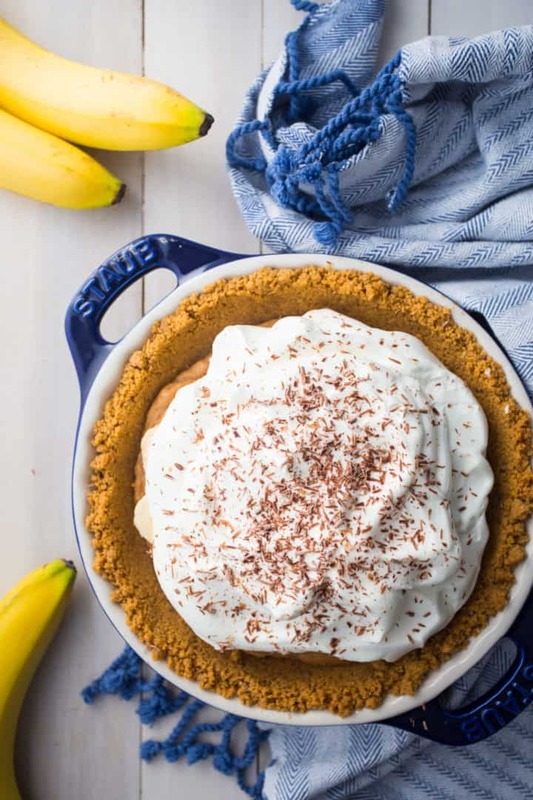 It’s got a crunchy, buttery graham cracker crust, a layer of smooth toffee filling, tons of fresh bananas, and a mountain of whipped cream. The toffee filling has an almost fudgy consistency, and the flavor is a lot like Biscoff cookie butter (aka: speculoos spread) or a really flavorful butterscotch. 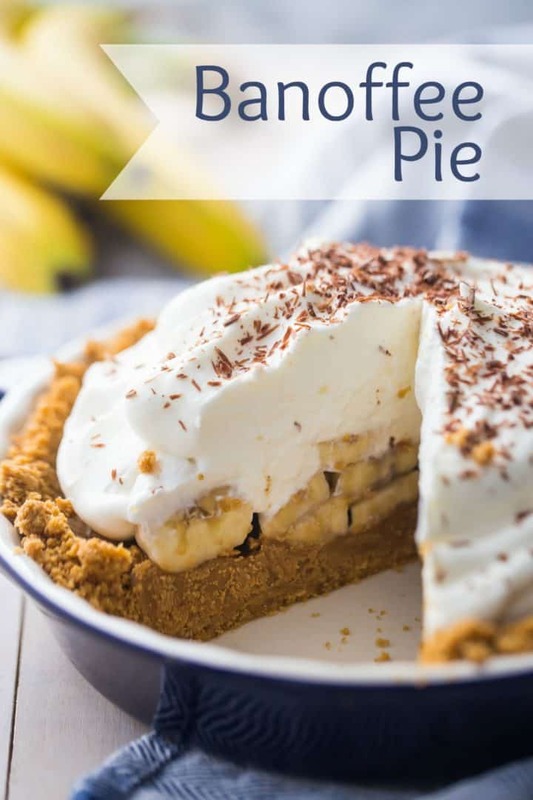 It’s very buttery and rich, and it’s got a slightly savory backnote that compliments the sweet bananas in such a gorgeous way. I absolutely love the combination! This yummy concoction begins with a graham cracker crust. It’s a perfect crunchy compliment to all the soft and creamy. Graham cracker crumbs, brown sugar, a little cinnamon, salt, and melted butter just get stirred together and pressed into the bottom of a standard-sized pie plate. If you’d like more info on the crust, click here: Graham Cracker Crust. Next up is the toffee filling. It’s only 4 ingredients! Stir butter and brown sugar together in a pot over medium-low heat. Be careful it doesn’t get too hot, or you’ll end up with an oily, separated mess. Just keep it stirring and let everything slowly melt together, until it looks syrupy and well-combined. Then add in the condensed milk and salt. Keep on stirring, and let this bubble for a minute or two, until it looks a shade darker and thickens. Keep in mind that it will become even thicker as it cools. Once you’ve got the color and consistency you like, pour it into the crust and top with sliced bananas and whipped cream. For garnish, I like to run a veggie peeler down the side of a chocolate bar to make chocolate shavings, but you could also just dust it with a little cocoa powder. Sadly, this dessert does not keep for very long. It’s because of the fresh bananas. I’m sure you’ve seen it happen before; once a banana is peeled it will quickly start to oxidize and turn black. So try to eat it all up within 24 hours of it being made! 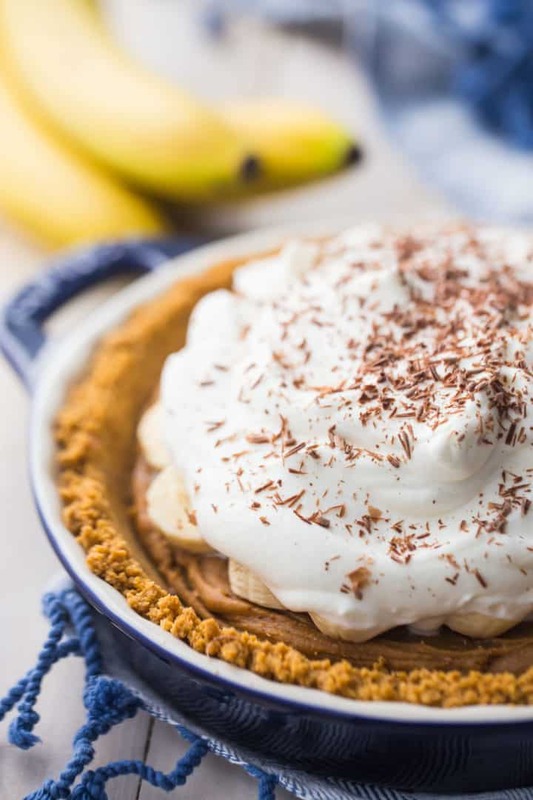 Bring this Banoffee Pie to your next get-together! 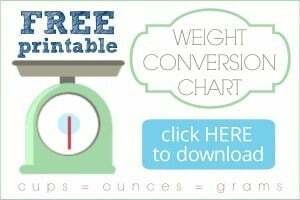 Your friends and family will love it! 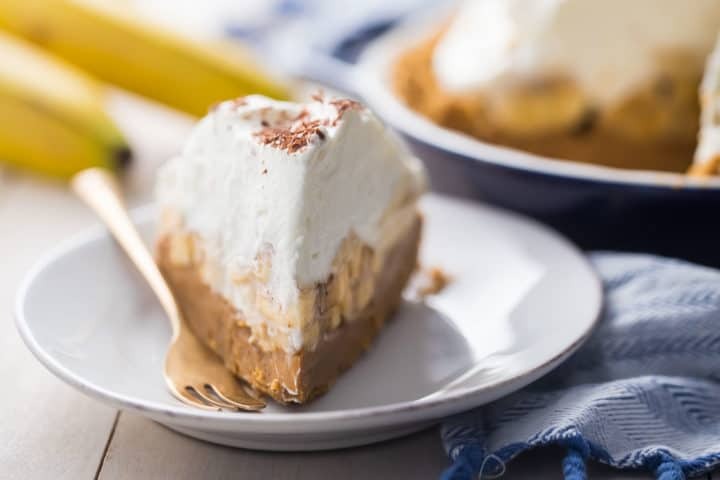 Banoffee Pie: a classic combination of bananas and toffee, layered in a crunchy graham cracker crust and crowned with whipped cream. You'll fall in love! Tip the mixture into a 9-inch diameter pie pan, and press into the bottom and up the sides. Place the butter and brown sugar in a small pot over medium-low heat. Cook, stirring, until the brown sugar and butter are syrupy and combined. Add the condensed milk and salt, and bring to a low simmer, stirring. Simmer for about 1 to 2 minutes, stirring, until the the toffee has become darker and thickened. Transfer the toffee to the prepared crust, and top with sliced bananas. Whip the cream and powdered sugar together until it holds stiff peaks. Top with pie with the whipped cream, and garnish with chocolate shavings. Make chocolate shavings by running a veggie peeler down the side of a bar of chocolate. This pie looks crazy delicious! I’m sure it disappears fast!